In my 10/6/14 posting “A dogmanteau”, a texty composition with the complex portmanteau labracadabrador. And in my 7/9/14 posting “Layered portmanteaus”, a Bizarro with abracadabradoodle, a portmanteau of abracadabra + labradoodle, where labradoodle is a portmanteau (attested) of labrador + poodle. (#6) The face and upper body: how to read it? I saw sexual interest mingled with indecision, but never settled on a caption that pleased me. (#7) Be me! Do me! Buy me! (#8) [from the ad:] The Garçon Model Camo Collection is your essential arsenal for any good military-theme party or just plain daily-life survival. We like to call it “underwear on a mission.” Ultra soft waistband. Soft, lightweight fabric. Tagless for itch-free comfort. Oh my, a world where military-theme parties that call for a camo-pattern jockstrap are unremarkable events! All this to help you celebrate National Underwear Day. The holocausts. The fire-bombing of Dresden on February 13th-15th, 1945, and then the atomic bombing of Hiroshima (August 6th, 1945) and Nagasaki (August 9th). 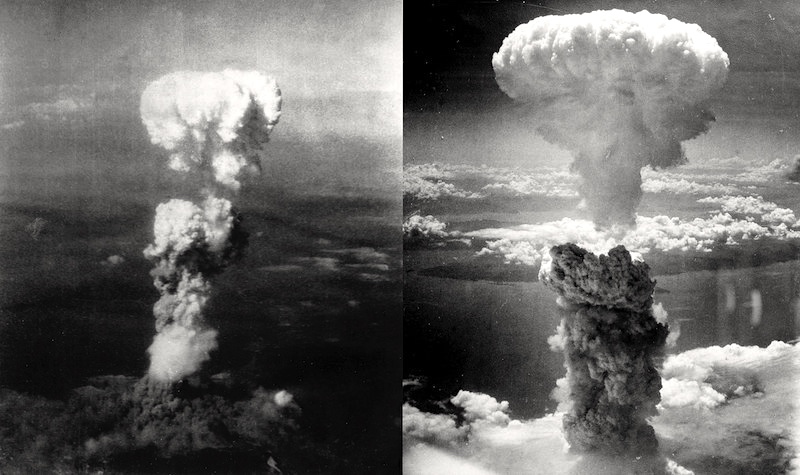 The atomic bombs were named, Little Boy (Hiroshima) and Fat Man (Nagasaki) — both personified, and male. “It’s a boy,” Edward Teller exulted after the world’s first hydrogen bomb exploded in 1952 with a force 1,000 times more powerful than the bomb that destroyed Hiroshima. From the start, the nuclear era seethed with sexual allusions. Military officers joked about the phallic symbolism of their big missiles and warheads — and of emasculating the enemy. “Dr. Strangelove” mocked the idea with big cigars and an excited man [Major T.J. “King” Kong, played by Slim Pickens] riding into the thermonuclear sunset with a bomb tucked between his legs. From that time, such mushroom clouds have been folded into the sexual imagery of the atomic age: the bombs as symbolic phalluses, the mushroom clouds as symbolic ejaculations. Nuclear come shots. Shudder. 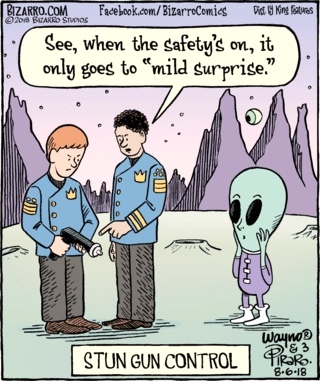 This entry was posted on August 6, 2018 at 7:48 pm and is filed under Holidays, Linguistics in the comics, Palindromes, Phallicity, Phrasal overlap portmanteaus, Portmanteaus, Pragmatics, Signs and symbols, Speech acts. You can follow any responses to this entry through the RSS 2.0 feed. You can leave a response, or trackback from your own site.